10th May 2010 - New Security Advisory, see Ticket #1518. 4th May 2010 - New Security Advisory, see Ticket #1515. 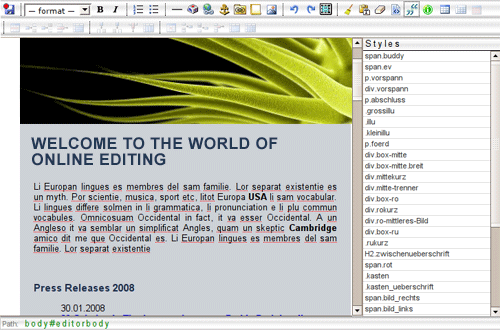 Xinha (pronounced like ​Xena, the Warrior Princess) is a powerful WYSIWYG HTML editor component that works in all current browsers. Its configurabilty and extensibility make it easy to build just the right editor for multiple purposes, from a restricted mini-editor for one database field to a full-fledged website editor. Its liberal, BSD licence makes it an ideal candidate for integration into any kind of project. Is Xinha under active development? No updates for years? What's going on? Mostly the current trunk ( checkout with "svn co ​http://svn.xinha.org/trunk/ trunk" ) is what is used in even production systems. Xinha is open source, and we mean it, if you want to progress the development of Xinha in some way, please contact James Sleeman ( See Xinha Developers ) and he will arrange for SVN commit and Trac management access. The forum was made read-only some years ago due to being too difficult to maintain, monitor and keep on top of the spammers. There is once was a mailing list available at ​http://www.openplans.org/projects/xinha/lists/xinha-discussion, it's gone now.